Do half link chains work on any bike and what is their purpose? Do half link chains work on any bike? What is the purpose of a half link chain? I've noticed that only BMXers and DJers use them, and that leads me to believe there is a technical reason behind that. "Half Link BMX chains were designed to help dial in the chain length on frames with short dropouts and small gearing, making sure your rear wheel is exactly where you want it. Dan's Comp offers a wide variety of half-link BMX chains for both race and freestyle." Basically, you can break your chain at smaller increments to get a more precise chain length. 1/2" instead of 1". Half link chains should work with most single speed set-ups, but not with any bike with multiple sprockets / chain rings. Not the answer you're looking for? Browse other questions tagged chain bmx technology jumping or ask your own question. How do half link chains perform for long term use? 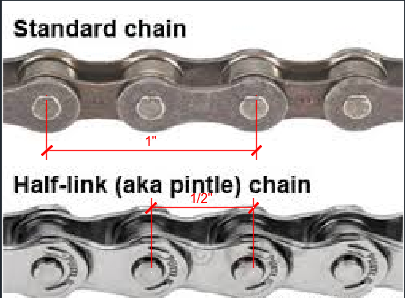 Why don't standard bike chains have inner/outer combo links so odd chain lengths are possible? Chain replacement - how many links 114/116?